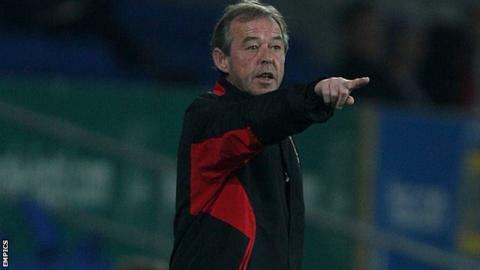 Brian Flynn celebrated his first game in permanent charge of Doncaster with victory over Leyton Orient thanks to goals from Rob Jones and Chris Brown. Jones opened the scoring 18 minutes into the game after converting David Cotterill's corner from close range. James Coppinger saw a header superbly saved by Orient keeper Jamie Jones while Paul Keegan also went close. Brown made the game safe after firing between Jones' legs when one on one while Paul Quinn also hit the post. The result left Doncaster second in the table but level on points with Tranmere above them. "In terms of performance and the result, I'm more than happy. "Some managers are greedy in the fact that they want more goals. "The chances we produced and the quality of our forward play was very, very good at times. "But that was built on rock solid defending." "It was a good display from Doncaster today. "They worked tirelessly to get the game on and credit to the groundsmen. "The pitch became a little bit awkward but it wasn't to be blamed for our performance. "It was slightly disappointing for me to say the least."